Another great thing about Christmas and the festive season are the Christmas songs. If you love travelling in a group around the neighborhood and belting out your favourite Christmas tunes, no one is stopping you. Especially if your kids love singing, take them along too. You definitely can’t go roaming around the block singing in your jeans and tshirt, you gotta look the part of a caroler too. 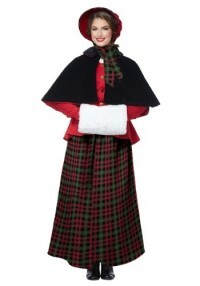 Dress up your whole family in a caroler costumer and they will stop and listen. Click here for more Christmas costumes. 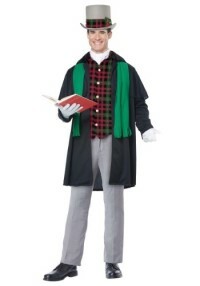 Find Christmas Caroler costume ideas below for the whole family. This timeless take on a holiday classic will tickle your kid’s fancy from Thanksgiving all the way ’til 4th of July! Talk about a holiday season! It’s a tasteful and totally iconic way to work the magic in throughout the year. It has a tartan plaid vest and a coordinated plaid-banded top hat, which is totally adorable and also proves perfect for tipping the brim and greeting folks at their doors. Mug of cocoa, songbook, and eternal holiday cheer not included, but we’re certain your little guy can produce those on his own! 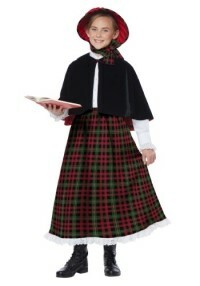 Click here to get Christmas Caroler Costume for Kids. This great look centers around a plaid vest in classic Christmas colors, worn under a black coat with a cool capelet. A white neck scarf can be tied to Victorian-era perfection, while the top hat (as promised) has a matching plaid ribbon and even a sprig of holly for added holiday cheer. This outfit will take you back to Christmas eve feasts in the Victorian era (and not to mention, one of your favorite classic films) with its timeless styling and warm, holiday hues. It comprises long, green-and-red tartan plaid skirt, a holly-red top with gold buttons and a cute little capelet to keep you warm. The red bonnet is trimmed in matching plaid, and ties under your chin to stay put, even in a cold winter wind. 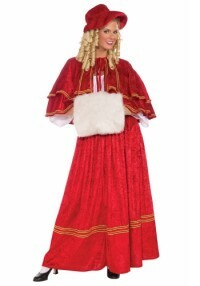 Click here to get the Christmas Caroler Costume for Adults. The lovely red hat, shawl, and skirt all look like real velvet without requiring a velvet budget, and the muff is made from fluffy puffy stuff to keep your hands toasty. 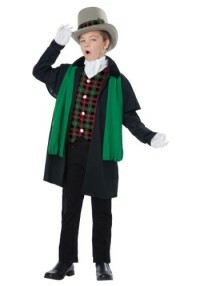 Click here to get Christmas Caroler Costume for Adults.